A great deal of my personal training happens at clients’ homes. As part of my interview process with a new personal training client I always inquire about fitness equipment available at their house. Most common pieces of fitness gear my clients have are swiss balls and a pair of very light weight dumbbells. Obviously, this is not enough, as my training involves a variety, but basic exercise equipment. Since most of my clients do not have the space to fill their homes with big bulky and expensive machines, I always recommend the following exercise equipment. My clients will have all the gear they need to meet their fitness goals without cluttering up their homes or apartments, or breaking the bank. Swiss balls or sometime known as stability balls are a staple item of all types of gyms. This is a great replacement for a dedicated bench. You can use it for a variety of exercise programs, including weight training, stability training, mobility training, hiit and stretching. You can find them almost anywhere. Online retailer Amazon has the best pricing I’ve seen. Depending the size you need, you can get a good quality stability ball between $10-$30. But I got my swiss ball at a local sporting store for $20. Kettlebells are probably the best piece of fitness equipment you’ll ever own. Great for functional training and strength building as most of kettlebell exercises easily work multiple muscle groups at once. A kettlebell can eat up most of your $100 budget, but if you shop around on classifieds such as Kijiji and Craigslist you can find great deals. Start with low weight until you’re comfortable and have mastered a few basic movements. I have a 45lb kettlebell that cost me $45, and that was already discounted from $90. 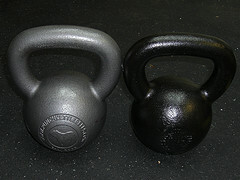 I also got much lighter kettlebells for use with beginners. The starting weight I recommend is 15lbs or so. And you can easily find a 15lb kettlebell for $20. Everyone knows what these are. Get a pair, or a few. Whatever your budget allows. There are tonne of exercises and workouts we can do with these. Shop around as prices can vary greatly from $0.90/lb to well over $2.00. Once again, go onto your local classifieds and you’ll find amazing deals on both new and used dumbbells. A weighted medicine ball is just a heavy ball. It closely resembles a basketball and comes in a variety of weights and diameter. Some retailers over price them. Wait for them to go on sale or look around for less known sporting goods store for better prices. A good starting weight would be 6lbs which you can easily find for $20. 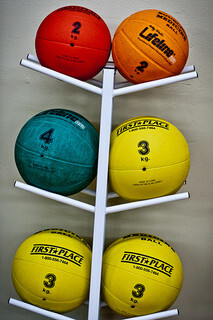 Medicine balls are great for adding resistance to dynamic exercises and workouts. Another great piece of equipment for the home gym. Elastic rubber bands come in different tensions and lengths. You can usually buy a set with each band being a different tension for around $15-$20. This is one of my default go to pieces of equipment when I visit clients’ homes for the first time and they do not have all necessary equipment to start with. $3 for a jump rope? Yes, $3. I used to buy the expensive kinds for around $20 and they would often break, until I discovered a simple speed rope, aka, skipping rope, for a mere $3. The best part? It lasted me for about four years now. It’s the best $3 I’ve ever spent on a fitness equipment and I use it during every workout. I even wrote a blog post on why you should skip during your workout. You can find a true jump rope at your sporting goods store that supplies sports gear to schools and teams. You can get $3 skip rope at Merchants in Toronto. Got a smart phone? Download an interval timer app. There are many of them out there, so it will come down to a matter of personal preference. I use Interval timers for Tabata and other HIIT workouts. My favourite app to use is Seconds Pro. There’s a free version, but I liked enough to fork-out $5. This is essentially all the home gym equipment you need to get started. You don’t need fancy machines that only drain your bank account and take up space. Images courtesy of: Susy Morris, Andrew Malone and John Calnan.